The Seattle Coalition for a Healthy Workforce joined local business owners in City Hall today to unveil a new proposal to ensure all people working in Seattle have paid sick days. 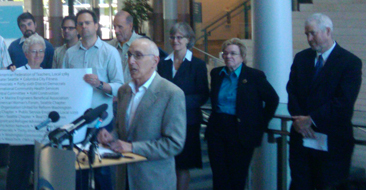 Seattle City Councilmember Nick Licata said he plans to introduce legislation reflecting the new agreement on Wednesday. The Coalition has worked closely with Seattle business owners over the past few weeks toward the shared goal of creating a healthier Seattle through paid sick days. The result is a new “common ground” proposal that will ensure all people working in Seattle have paid sick time for basic health needs, while providing flexibility for the unique circumstances of Seattle’s diverse small businesses. Support for a paid sick days ordinance continues to grow – over 70 faith, labor, health and other organizations now endorse the measure, and a growing list of local business owners have also voiced their support. This entry was posted in In the news, Paid sick days and tagged business, press release, seattle. Bookmark the permalink.